IMG Citrus President Michel Sallin and his daughter and company CFO Melanie Ressler believe there is a good future for fresh fruit varieties in Florida. Anytime you see a new citrus planting in Florida, it gives hope for the future of the state’s signature crop. To see a new planting in Lake County, where acres have been on a steady decline since greening came on the scene, it’s cause for even more excitement. IMG Citrus is putting its belief in the future into practice with a multi-phase planting in Groveland on its Cherrylake ornamental farm property. The plantings will feature ‘Tango’ and ‘Bingo,’ which will replace an old Hamlin grove that had become less productive due to greening. The trees are being planted on US897, US942, and X639 rootstocks. And, some trees will be rooted cuttings to see how they perform. Sallin’s daughter Melanie Ressler is IMG’s CFO, and she, too, is happy about the new fresh fruit plantings. “With ‘Bingo’ and ‘Tango,’ we are coming into a product that has incredible traction in the market when you look at the popularity of Cuties and Halos, so it is exciting to have fruit that can compete in that market,” she says. The first two phases of planting already are in the ground with 11 acres of ‘Bingo’ and 13 acres of ‘Tango.’ Another 40 acres will be planted in November, and an additional 40 acres are planned for 2019. An experimental, very high-density planting as well as a block of citrus under protective screen (CUPS) also are in the works. 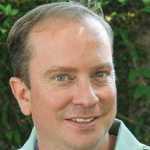 Brian Randolph, IMG’s Production Director for nearly 20 years, is enthusiastic about the chance to deploy new management tactics on the additional acres. This means planting trees at a higher density to bring them into production more quickly. 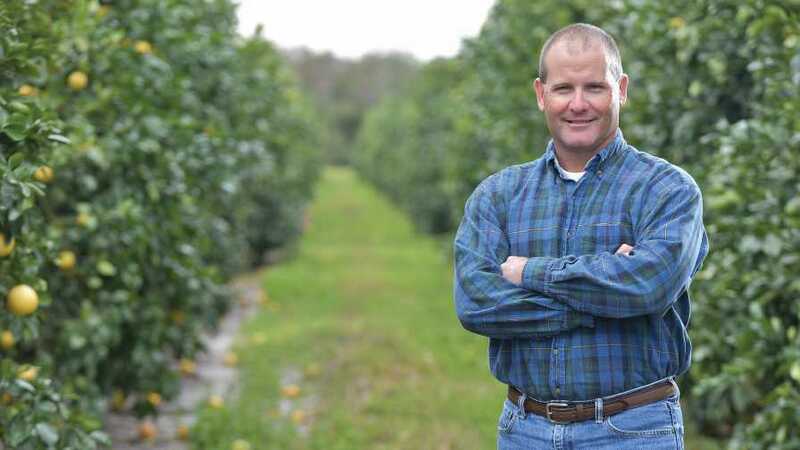 Production Director Brian Randolph says it is an energizing time at IMG Citrus as the company experiments with innovative practices to successfully grow fruit in a greening environment. Plant nutrition is widely recognized as critical to production in a greening environment, and Randolph says that holds true with IMG. Given the sandy soil where the new blocks are going in, he says they first wanted to build up an organic base by applying 4 tons of treated compost per acre before planting, with a plan to add 2 more tons per season for the foreseeable future. He also likes the compost because it establishes a foundation for beneficial microbes to live in the soil and root zone. He supplements this with applications of microbes and other biostimulants. Randolph had a high-tech irrigation system installed in the new groves to very precisely apply water and fertigation. He says this will really be the foundation of their fertilizer program. The system by Eco Drip can be operated wirelessly and uses soil moisture monitoring and weather stations. When the trees are three years old, Randolph will have sub-surface drip tape installed down the middle of the rows to apply water and fertilizer to support roots beyond the tree trunk area. Randolph adds that while their irrigation and nutrition program is built around growing trees in a greening environment, it also is built on sound stewardship. Randolph adds their psyllid control program is aggressive to protect young trees to get to commercial production. They are currently testing individual tree netting to protect the trees from the psyllid and greening. 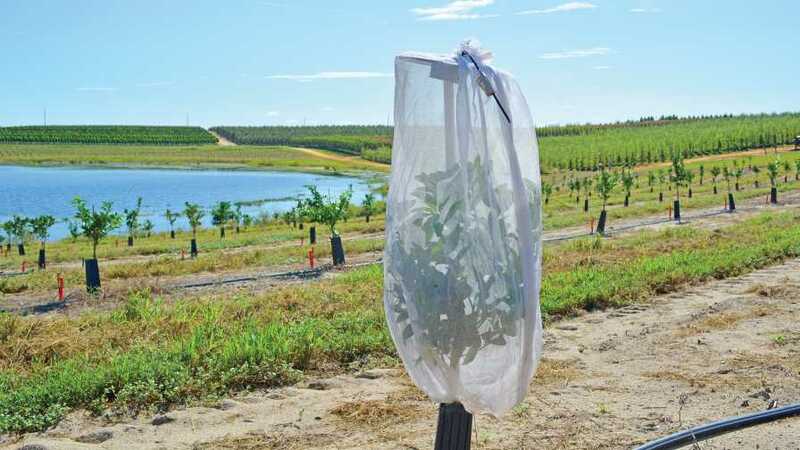 IMG Citrus is experimenting with mesh bags to protect young trees from Asian citrus psyllids and the spread of HLB. There is high density, then there is even higher density. The planned 3-acre planting of a 1,000-tree-per-acre takes density to a new level. The higher density is aimed at a bigger and quicker payout on investment. The trees will be grown in the same type of air pot containers used to grow trees by IMG Citrus’ sister company, Cherrylake Inc. The planting will try several different sized pots from 7 to 15 gallons to determine the best fit. Trees will be grown on a trellis to manage size and make for easier harvesting without ladders. Based on what is learned growing in the pots, a 10-acre CUPS planting also is in consideration. If the experiment proves citrus in the pots are as productive and profitable as believed, CUPS would add another layer of protection over the planting. “We are experimenting with things, and that’s exciting as we move forward,” Randolph says. While there is no question that planting new citrus blocks in a greening environment comes with risk, Sallin says there are enough positive signs out there to give it a chance. He says to consider shipping costs. Getting those Cuties and Halos from California to the East Coast costs about $8 per carton. “We will be able to deliver our fruit anywhere in Florida for about $1 per carton in transportation costs,” Sallin says. Ressler says growers should consider the incentive programs available to help cover the investment in planting new groves. She says it has been helpful in their new plantings. IMG Citrus also tapped into the USDA’s Environmental Quality Incentives Program for cost-share to help cover investments in the new high-tech, conservation-minded irrigation system installed in the new groves. The Tax Cuts and Jobs Act also provided newly expanded tax advantages and incentives for new investments in groves. 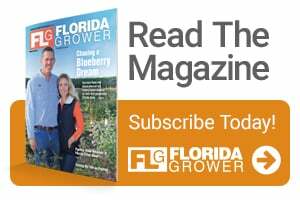 Giles is editor of Florida Grower, a Meister Media Worldwide publication. See all author stories here.